A large number of community members took out bike and foot rallies in Jammu city and held demonstrations against the film. JAMMU: Rajput community members today held protests in Jammu city demanding a ban on the release of the film "Padmavati", alleging that the makers have distorted historical facts. 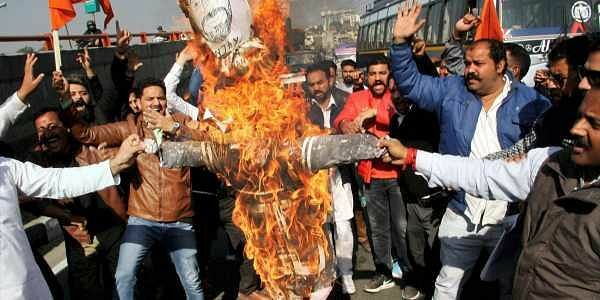 The protesters carrying effigies of Bhansali marched on streets of Jammu and demanded there should be criminal case registered against Bhansali. "Padmavati", featuring Padukone, Kapoor and Ranveer Singh in the lead roles, has been facing the wrath of various Rajput groups and political leaders, who have accused filmmaker Sanjay Leela Bhansali of distorting history. Historians are divided on whether Padmini actually existed. She finds mention in the 16th century epic poem "Padmavat". Earlier scheduled to hit cinema halls on December 1, the release date of the film has been postponed by the makers till further notice.